Background Psoriatic arthritis (PsA) is a chronic inflammatory disorder associated with skin and joint manifestations, several extra-articular symptoms, various comorbidities, and disability. The emergence of tumour necrosis factor inhibitor (TNFi) therapy has dramatically changed the course of disease. Over the past decade new TNFi therapies have emerged (certolizumab pegol and golimumab), and recently ustekinumab and secukinumab have also become available for PsA. Objectives The objective of this study was to assess the relative use of biological agents (bDMARDs) in PsA from 2006 through 2014, using data from the Nordic Rheumatology registers. Methods Based on data from the observational registers DANBIO, ICEBIO, NOR-DMARD, ROB-FIN, and SRQ registers, PsA patients initiating treatment with bDMARDs as a first or subsequent biological therapy were identified. Adalimumab, etanercept and infliximab were grouped as “first generation TNFi therapies”; certolizumab pegol and golimumab were grouped as “second generation TNFi”. Treatments with ustekinumab during the study period were also identified. Descriptive statistics for prescription patterns of bDMARD therapy were calculated. Results A total of 11,458 treatment initiations were identified (DANBIO 3,068, ICEBIO 357, NOR-DMARD 1,113, ROB-FIN 708, SRQ 6,212). 54% of the patients were female. Overall, 5,695 patients initiated a first generation TNFi, 912 a second generation TNFi, and 16 ustekinumab, as their first course of biological treatment. The corresponding numbers for those initiating a second (or more) biological treatment were 3,606, 1,090 and 139 patients, respectively. 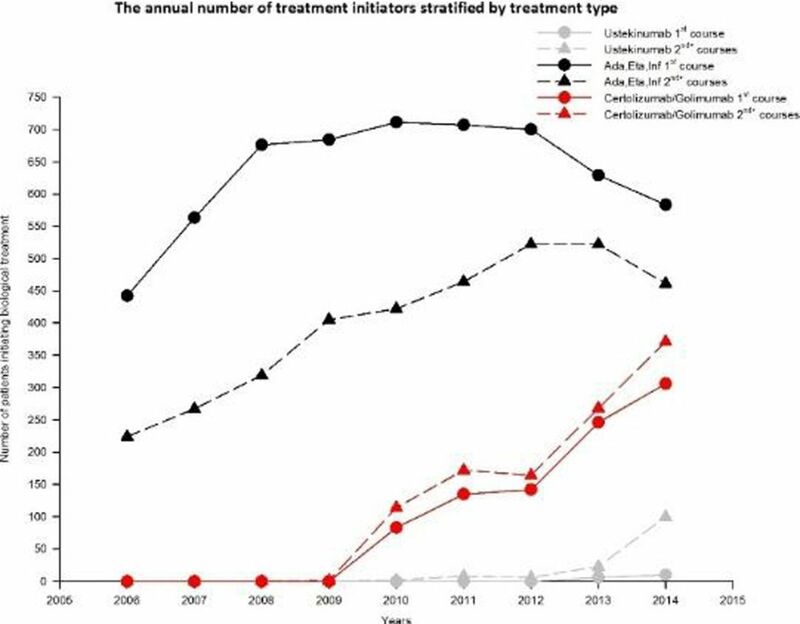 The figure displays the annual number of treatment initiations stratified by treatment type. The total yearly number of first course biological treatment increased significantly throughout the period (p<0.001), and this was also the case for patients switching therapy (p<0.001), indicating a previously unmet need for biological therapies in the Nordic population. The annual number of patients initiating first generation TNFi both as first and subsequent course of therapy decreased significantly towards the end of the study period (p<0.001). This drop was more than offset by a rapid increase in initiation of second generation TNFi treatments (p<0.001). Ustekinumab was primarily used as second or subsequent course of therapy in PsA. The same pattern was seen when stratified for country (data not shown). Conclusions Across the Nordic countries the prescription pattern for biological therapies for PsA has changed significantly over time. After 2012 initiation of the first generation TNFi is decreasing both as first and second course therapy, whereas second generation TNFi are increasing both as first and second course of biologic intervention. Collaboration across registers will allow for robust assessment of the uptake of newer biological therapies. Acknowledgements This study was partly funded by a grant from NordForsk and Janssen Pharmaceuticals.